The Indianapolis Colts never cease to amaze me; although to be fair, when you have been a Colts fan for as long as I have (39 years and counting), what they seem to do on a weekly basis seems eerily commonplace. When the Colts went to take on the Jacksonville Jaguars Thursday night, I didn’t expect a high-scoring event as most weeks the Jaguars are lucky to eclipse 20 points a game. In any case, both teams hooked up at Jacksonville Municipal Stadium and the game had the feel of a track meet, so to speak. Defense was definitely an afterthought and interestingly enough, Jacksonville held the ball for 11 minutes longer than Indianapolis. Both teams seemed to score at will (did I mention that not much defense was played? ), but as has been the custom this season, Peyton Manning tossed a late touchdown pass to Reggie Wayne with 5:23 in the fourth quarter, enabling Indianapolis to remain perfect as they got past Jacksonville 35-31. Manning was perfect in the first half, going 12-of-12 for 116 yards and had TD passes to Austin Collie and Dallas Clark; Clark made an improbable sliding catch in the end zone which put the Colts up 7-3 early in the second quarter. Collie’s 23-yard catch put Indianapolis ahead 21-17 withy 35 seconds left in the half; the Jaguars got ot within field goal range but kicker Josh Scobee came up short on a 57-yard FG attempt. 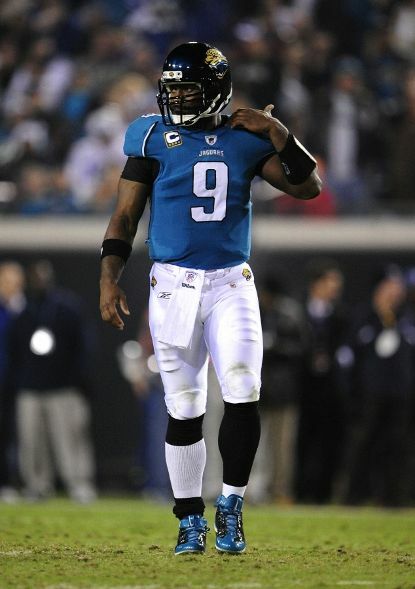 The Jaguars would take the lead at 24-21 with a 16-yard David Garrard TD pass to Mike Sims-Walker but Manning would again hook up with Clark on a 27-yard TD strike, putting the Colts ahead again 28-24; a 13-yard Garrard-to-Mike Thomas TD pass put Jacksonville up at 31-28 with 47 seconds. But Manning would lead the Colts down the field and with 5:23 left in the game, he connected with Reggie Wayne on a 65-yard bomb which put Indianapolis up for good 35-31. Manning had good numbers, going 23-of-30 for 308 yards with 4 TD’s and an interception while Garrard went 23-of-40 for 223 yards with 3 TD’s and an INT. Joseph Addai led the Colts rushers with 16 carries for 59 yards while Maurice Jones-Drew rushed 27 times for 110 yards and a TD while catching 5 passes for 30 yards and a score. Wayne led all Colts receivers with 5 receptions for 132 yards and a TD while Clark caught 7 passes for 95 yards and 2 TD’s. Sims-Walker led the Jaguars receivers with 6 receptions for 64 yards and a score while Marcedes Lewis caught 4 passes for 53 yards. Indianapolis (14-0) gets a long rest as they do not play again until Sunday, December 27 when they play their final game at Lucas Oil Stadium this season, hosting the New York Jets while Jacksonville (7-7) travels to Foxborough, MA to take on the New England Patriots, a week from Sunday.